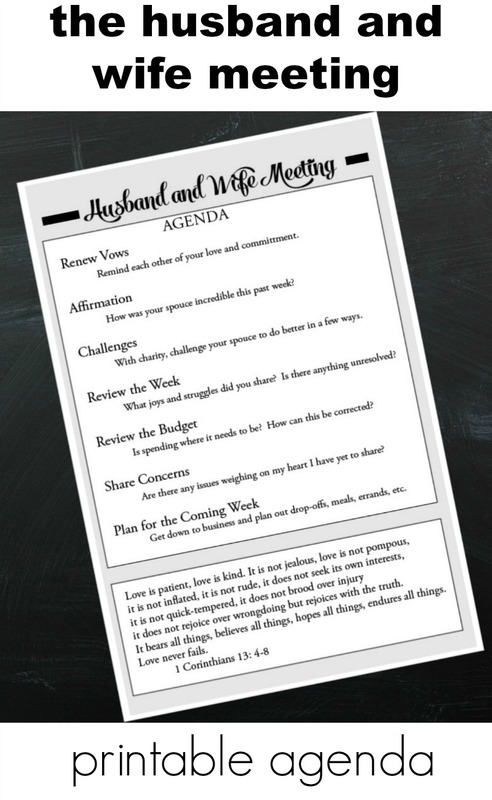 I am stopping by just briefly to share something I just could not find anywhere else (hence I made my own)–Husband and Wife Meeting Printable Agenda. 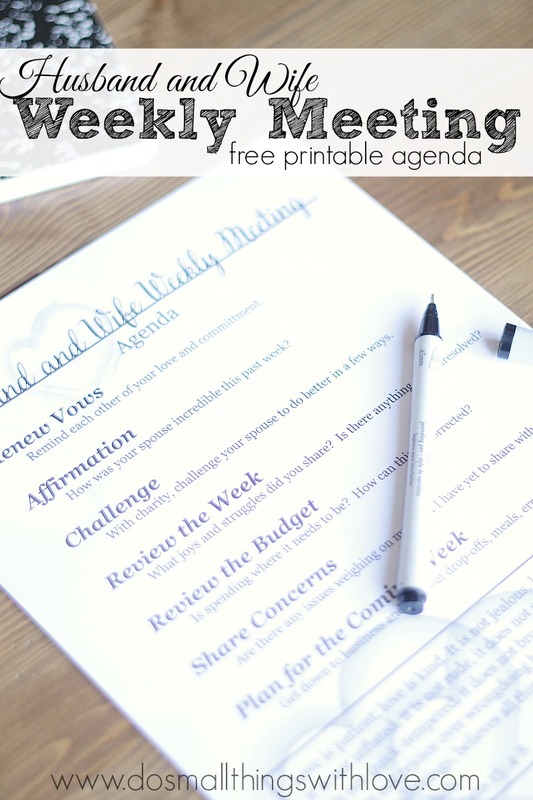 This is meant to be used weekly to help married couples, like me and my husband, communicate about the big and little things. If you’d like a copy of it, please sign up below and the PDF will be sent directly to your inbox. Here’s a little back story on this. I belong to a wonderful women’s group of my parish. We talk about all sort of things in marriage, motherhood and family. 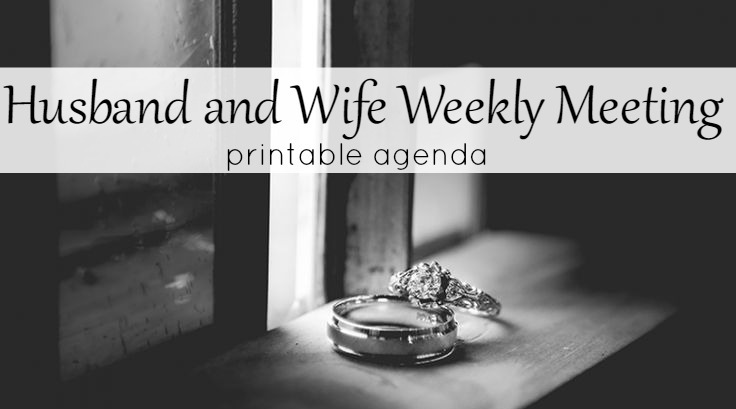 The other week one of the ladies mentioned the weekly meetings she has with her husband–one where they not only plan the coming week, but renew their vows, affirm and challenge each other. 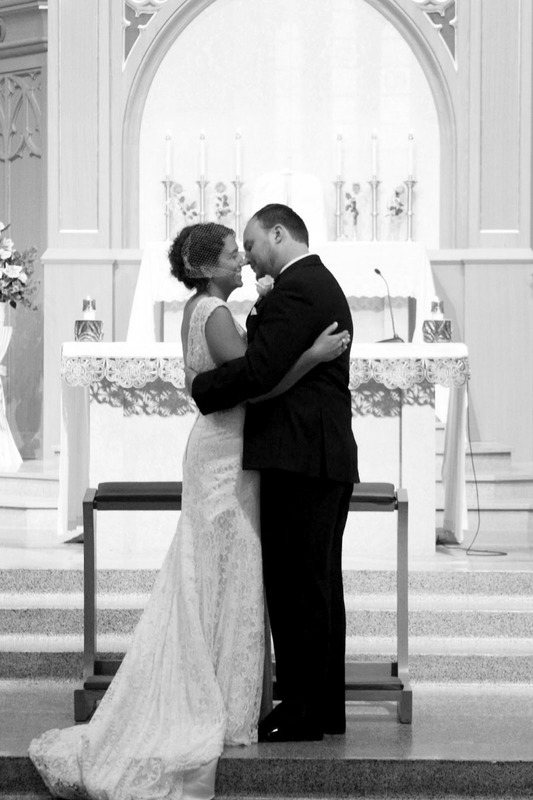 My husband and I have never done anything this organized–and often we’ve suffered for it. 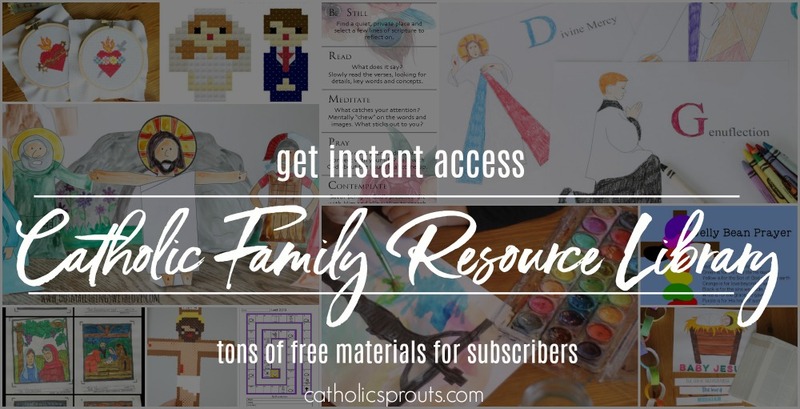 Not only does my natural state of disorganization not suit a growing family very well, but sometimes it’s hard to spontaneously renew our love or challenge each other with charity. Plus, I love the fact that my husband and I could use this meeting to calm down our lives which have lately felt a bit frantic. I left the women’s group of my church determined to add this meeting to our Sunday nights. All I had to do was find an agenda. There had to be a printable one out there on the internet…somewhere…right…? Well, I guess not. After a whole lot of searching…and zero success I decided to just make my own. I really wanted a hard copy agenda to make this meeting stronger and more purposeful. My husband and I can gab and gab and get off topic pretty quick–and then totally not do what we had intended to do. So, this agenda will not only keep us on topic, but add a little bit of seriousness to what we are doing. All the best, and if you have any tips or stories to report back, I would be thrilled to hear them. Thank you again for posting this!! oh no! Thank you for letting me know! I’m so stoked to have found this. I’ve had it on my heart for a while to implement weekly “marriage counsels” but didn’t know where to start! Thanks for the printable. I’m so excited! I think it’s something that will be so good for my marriage! wonderful! I hope it bares much fruit. I absolutely love this!!! I will use it and pass it on to my sister as well. We have four kids ages 8, 5, 2, and 6 months. Finding the time to do anything is difficult but since I’m a stay at home mom and my hubby works in an office setting, we message each other frequently. Something we had started doing this year to help our communication is to express our feelings. Not necessarily just romantically, but for instance, one morning I messaged him and asked if we could have our “feelings update”….so he proceeded to tell me he felt happy, productive at work, but stressed about something with the kids. We then discussed it and devised a plan to ease the worry and then I shared my feelings. Some days the feelings convo only happens once or twice because they stay the same throughout the day but there have been times I’ve messaged him back an hour later and had to update again due to something new or maybe difficult going on. It has worked wonders for us. This seems like the perfect step to really take it to the next level! Thank you for sharing!!!! Nancy, this is a lovely idea. My husband and I meet weekly to do our budget, but we’ve been looking for a way to add more spirituality and to shift the focus from our money (or lack of it!) to each other. I will be sharing this with my hubby and on my FB page too. Thanks again! I’m thrilled. We love what it has done for our marriage. This is wonderful! The one thing that I would add, at the beginning and at the end, would be prayer. In the beginning, maybe a quick prayer to the Holy Spirit, asking for guidance, wisdom, maybe patience, etc, to help you stay on focus during the meeting. And maybe at the end – maybe each of you after discussing plans and sharing concerns, decide what you need the other to pray for you during the upcoming week. Then end with a short prayer of thanksgiving for God’s love and for the gift of each other and your family. yes yes! That is perfect and I will have to add it. Thank you! This is beautiful. Unfortunately I can’t access the page… Any other suggestions? Nancy – I just LOVE this!! It reminds me of my weekly prayer group agenda. I am so happy to have something similar to work through with my wonderful hubby every week. Thank you SO much!!! This Husband and Wife meeting is such a lovely idea. Thanks for posting. Reconnecting (and staying connected) to each other is a challenge especially with kids, jobs etc. I’m going to print your pdf and show it to my husband. I think he will be very receptive to the idea! On the connecting topic, here’s another great idea that we employ. We are Jewish so Friday night Shabbat dinner is a very important day to connect. We do a thing called “Leave Behind – Carry Forward” This isn’t a “Jewish” thing, it’s just one way we interpret the idea of letting go of one week and welcoming in the next week. At the dinner table everyone gets to say what they would like to leave behind from the previous week and what they would like to carry forward from it. For instance, this past week my 9 year old daughter Lexi said she’d like to leave behind the argument she had with her friend Sage and she wanted to carry forward the fact that the snow has finally melted and she got to play in the woods with her sister. We love it because as the kids get older finding ways to connect is so important. Many of the topics then spark conversations, for instance, I might ask my daughter what she could have done differently in the argument that may have brought a better outcome. Or we can all brainstorm on the tree house we are going to build in the woods this summer. Thanks so much for keeping up with your blog – you do it so much better than I do! I would never guess from all your great your crafts you post that you are even the slightest bit unorganized. You seem to really be on top of things! Keep it up! Nancy & Kim, thank you both for sharing your ideas. Nancy I am going to use the printable with my husband on Saturday mornings. We pray for each other each morning but during the week my devoted hubby has work on his mind. Saturday is the only morning that we are unrushed and we can simply sit back and relax. We have 4 adult children and have recently begun an every other week dinner with them so we don’t lose touch. Whoever can make it, meets at the home of that week (rotates). Kim, this is when I’d like to try your idea of ‘take it, leave it’. It’s a quick way to gauge what is impacting them the most. You are both a blessing! How wonderful! Thank you for sharing this! All the very best!